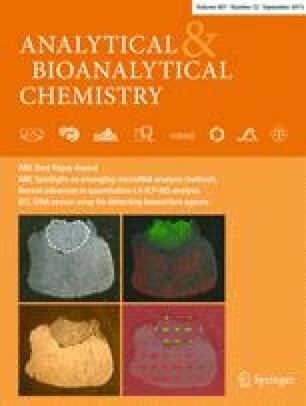 Absolute quantification of intracellular coenzyme A (CoA), coenzyme A disulfide, and short-chain acyl-coenzyme A thioesters was addressed by developing a tailored metabolite profiling method based on liquid chromatography in combination with tandem mass spectrometric detection (LC-MS/MS). A reversed phase chromatographic separation was established which is capable of separating a broad spectrum of CoA, its corresponding derivatives, and their isomers despite the fact that no ion-pairing reagent was used (which was considered as a key advantage of the method). Excellent analytical figures of merit such as high sensitivity (LODs in the nM to sub-nM range) and high repeatability (routinely 4 %; N = 15) were obtained. Method validation comprised a study on standard purity, stability, and recoveries during sample preparation. Uniformly labeled U13C yeast cell extracts offered ideal internal standards for validation purposes and for a quantification exercise in the rumen bacterium Megasphaera elsdenii. The online version of this article (doi: 10.1007/s00216-015-8825-9) contains supplementary material, which is available to authorized users.